Water Blowing Toys Bubble Gun Soap Bubble Blower Outdoor Kids Child Toys. Because the liquid is not allowed to send in plane, you have to make the soap water by yourself. Traditional toy type: bubble gun. Product Size:33cm( Before inflation)/110cm(After inflation). Type: Stress Ball. Age Range: > 3 years old. Age Range: > 3 year. Pink, Blue. Gender: Unisex. It will add joy and good atmosphere to your family. 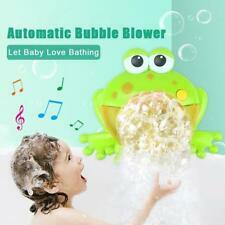 Amazing Output Bubbles --- Frog Bubble Machine can produce colorful bubble madness. Blow out countless bubbles and keep your kids entertained. Creat a dreamlike bubble world for kids.adding more bath cream,the bubble is more plenty. 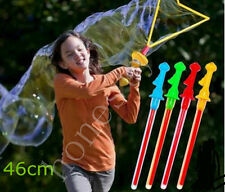 1 x Shining Bubble Gun. Put the head of the gun into the soap water. Size(bubble gun): approx. 14.5 11 3.7 cm. How to make soap water and use Because the liquid is not allowed to send in plane, you have to make the soap water by yourself. Because the liquid is not allowed to send in plane, you have to make the soap water by yourself. Traditional toy type: bubble gun. 1 x Bubble Gun,1xtray,(the Bubble Liquild not included ). Other toys under 14 years old. Note: Battery And Bubble Water Are Not Included. They are great tool for blowing bubbles. The different shape bubble makers can make different bubbles, which can give your kids a wonderful childhood. Perfect for as a gift to your kids or friends who have childrens. It is a toy that can make children play happily and parents rest safely. Included: 1 x Bubble Machine. Notes: 2 x AA Batteries and Bubble Liquid are not Included. Suitable Age: over 3 years old. Due to the different display and different light, the picture may not show the actual color of the item. · Product Size:33cm(Before inflation)/110cm(After inflation). Green ,Pink, Blue, Purple. · Due to the difference between different monitors, the image may not reflect the actual color of the object. Can blow out super large bubbles. Blow out colorful bubbles, Give the child a happy childhood. 1 pc Bubble Toy. Material: Safe Eco- friendly ABS. A Great Gifts for Children. And due to the difference between different monitors, the picture may not reflect the actual color of the item. 1 x Bubble whale. -The Bubble Machine can produce colorful bubble madness, creat a dreamlike bubble world for kids. Fit for Kids age over 18 months. -Great gift for all age of baby, it will add joy and good atmosphere to your family. Crab Bubble Maker Automated Spout Bubble Machine Bath Shower Kids Fun Toy & box. 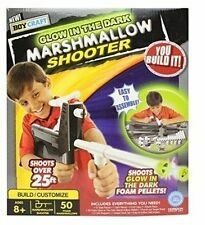 The bright LEDs inside light up at the pull of the trigger to flash colors as you shoot bubbles. These are a fun, new way to blow bubbles. The bright LEDs inside the ball light up at the push of the button and flash colors as you shoot bubbles. These are a fun, new way to blow bubbles. New - Musical Light Up Unicorn Bubble Maker. The bright LEDs inside light up at the pull of the trigger to flash colors as you shoot bubbles. These are a fun, new way to blow bubbles. New - Light Up Bubble Gun. Simply pour the solution into the reservoir, pushing the button to provide a steady stream of bubbles. Power by 2 x AA batteries(Batteries not include). Amazing Output Bubbles: Frog Bubble Machine can produce colorful bubble madness. (3) Dip wand in and blow SLOWLY- you can use either end to blow bubbles. 2) Do not over fill the tray- you just need a small amount on the bottle in order to blow. Traditional toy type: bubble gun. Because the liquid is not allowed to send in plane, you have to make the soap water by yourself. Other toys under 14 years old. Color: Random. Traditional toy type: bubble blower. Other toys under 14 years old. 1 x Crab Bubble Machine. - With flashing lights and built-in children's music. Model: B27655. Color: Red Yellow. What looks like a Bubble but plays like a ball?. 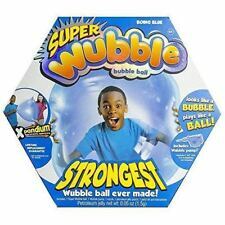 Its the amazing Wubble Bubble Ball! You can throw it, kick it, catch it and whack it! 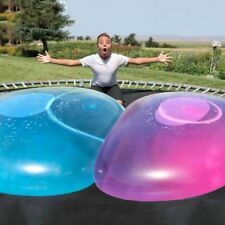 Its ultra durable and ultra fun! Includes pump, nozzle, inflation guide and patch kit. Easy to Operate: Just top up with bubble liquid and clear water, and press the switch button to On/Off it. Fit for Kids age over 18 months. The bright LEDs inside light up at the pull of the trigger to flash colors as you shoot bubbles. These are a fun, new way to blow bubbles. NEW - LED Bubble Gun. We will do our best to match your color choice. 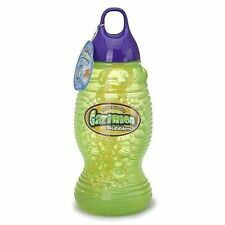 Included: 12Pcs Bubble Soap Bottles(without the suds). Color: Clear. If item is defective after 3 months, you can still send it back to us. We will send you a new one after receiving the defective item. Made of high quality plastic, the bubble wand tool is safe, durable and long lasting use. This item is manufactured with premium material for durable and long lasting use. 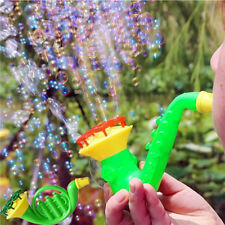 It is great tool for blowing bubbles, bringing more fun for kids. Buzz Bee Toys Air Warriors Predator Blaster. Pull back on the bolt and place a dart into the chamber. Push the bolt back and you’re locked and loaded and ready to launch a dart at your target, up to 100 feet away. 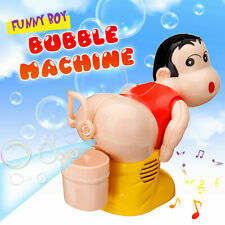 The Funny Automatic Fart Bubble Blower-Bubble Maker Toy Boy Stick Blower Machine. Note: Battery And Bubble Water Are Not Included. Lick A Bubble 2 Pack – Add Any Drink & Create Flavored Bubbles!